A wealth of research suggests that eating apples may impact your health in a number of beneficial ways. This illustration is meant to highlight how apple consumption has also been associated with a decreased risk of coronary heart disease, and a reduced risk of Type II diabetes was associated with apple consumption. 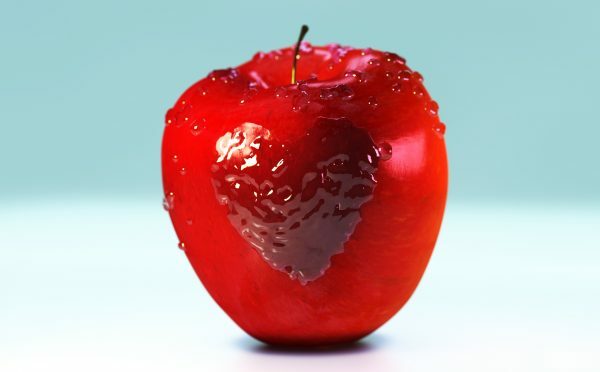 Apples are made of up 84% water and are also filled with Vitamin C, with most of the Vitamin C in apples come from the flesh. Vitamin C is important to the body. It boosts the body’s immune system against infectious agents, increases the production protein that is needed to make the collagen in the skin, teeth, cartilages and bones. It also increases the absorption rate of iron from other foods. Vitamin C also blocks out the free radical damages. Since this illustration was created digitally, in the future, I will animating this illustration, showing the growth of the “heart” shape of water on the skin surface, as part of a health awareness campaign.